Just Across from the Airport, Perfect for Your First or Last Night in Costa Rica. 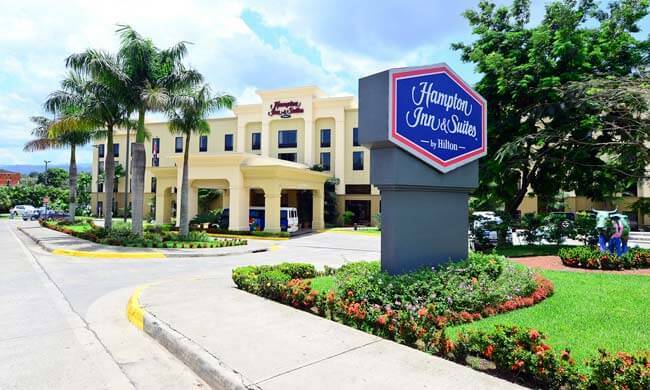 Conveniently located just across the highway from San José International Airport, the Hampton Inn & Suites is a great place to stay for a first or last night in Costa Rica. Comfort, service, and convenience make the Hampton Inn a great choice for any traveler. The Hampton Inn offers 100 spacious guest rooms and suites all with standard amenities including flat screen TV, A/C, safe, microwave, coffeemaker, mini-fridge, iron/ironing board, and hair dryer. Additional on-site services include luggage storage, coin laundry, business center, gift shop, convenience store, snack shop, fitness center, and swimming pool. Guests can take advantage of complimentary 24-hour airport shuttle service and free WiFi and International calls at the Hampton Inn. Breakfast is served on site at the Hampton Inn, but they don’t have a formal restaurant. For lunch and dinner, guests can walk 100 yards to the Denny’s or take a taxi to a number of restaurants in the area. Hot breakfast buffet is included in the nightly rate. 24-hour convenience store and souvenir shop where you can pick up travel necessities. Complimentary breakfast bar, free parking, local calls, cable TV, and internet. Conveniently located near a 24-hour Denny’s for late-night arrivals and early departures. Fiesta Casino provides gaming, dining options, and other entertainment within walking distance. Facilities include a business center, conference rooms, exercise room, swimming pool, and more. Car rental desk, laundry and valet services, tour desk, and multilingual staff. Free 24-hour airport shuttle and international calls.